ND: Could we hear about the details of this game’s development? Hayashi: With games like 3DS’ Samurai Warriors Chronicles, we included a rather tactical gameplay feature where you could switch the player character real-time on the lower screen. That was accepted very favorably, so we also included that when we made Hyrule Warriors Legends for 3DS. Although the amount of characters shown [on screen] was inferior to the Wii U version, I also think it had a deeper strategic play. When I thought ‘If we put this into the weapon triangle of Sword, Spear and Axe, it may really fit with Fire Emblem’, that was the trigger. Hayashi: I didn’t talk to anyone else in the company (laughs). After that, when we had a chance to talk with Nintendo, [offering us] to ‘do something together on a new console’, I felt ‘I’ve been waiting for this! Please let us do it!’ and delivered the proposal on that day. Hayashi: When we did that, Nintendo said ‘It’s good’, so the production was immediately decided. Usuda: I didn’t know about this interaction at the time. Hayashi: At that time, Usuda was still doing his utmost in creating Hyrule Warriors Legends. So I called him in for a brief chat and asked him ‘Do you like Fire Emblem?’ (laughs). ND: Which means its development had started in parallel with Hyrule Warriors Legends. Hayashi: It’s not parallel, but we indeed had started discussions with staff locally during the production of Hyrule Warriors Legends. However, around that time we just talked as [Fire Emblem] players, talking about the whole series in general or sometimes focusing on Fates, such as ‘Who did you marry [your character] with?’ (laughs). ND: So everyone on the team has played Fates in order to research for their next title. Hayashi: I think it’s okay to have some considered it as a research, but we’re just playing it as fans. 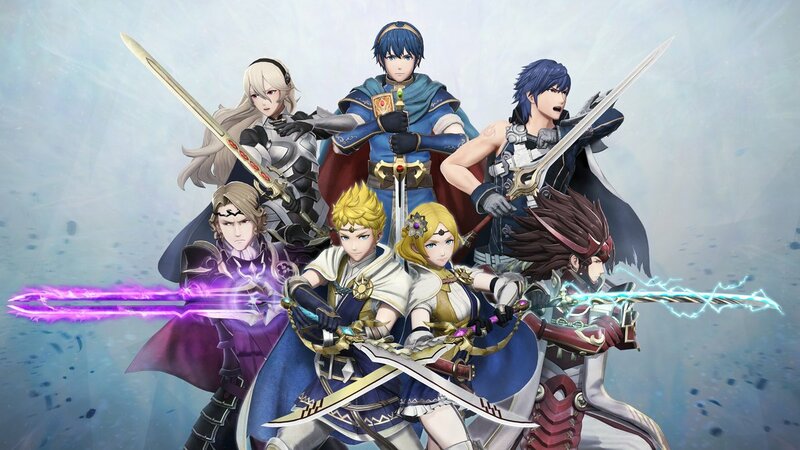 Hayashi: Just like Zelda, Fire Emblem also has a long history, so many of our staff have known about it in some sort. And although their fond memories are different, all of them do like the Fire Emblem series. That’s why the discussions before entering production were very exciting. There are also those who ‘like Radiant Dawn’, and others who ‘don’t acknowledge anything but the first game’. There were also topics we could talk about in different meetings, like ‘Saizo and (Suzu) Kaze are the Red and Green duo in Fates, aren’t they?’ (laughs). ND: And Fire Emblem Warriors was announced at the Nintendo Switch Presentation 2017 on January 13. How were the reactions to that? Usuda: We’re glad that there were great reactions from both inside and outside Japan. Hayashi: We didn’t know the whole contents of the presentation. Of course I thought it would be good if it could become widely discussed, but since there ought to be so many new titles announced, I thought it’d be good if we could at least make it to around the 5th ranking in the trend. And then we received word that ‘It’s being widely discussed after Splatoon 2 on Twitter!’. So I was like ‘We did it!’ (laughs). Hayashi: Before pressure or anything else, first of all I felt glad. The video also went as planned. While enthusiastic fans would understand with the presentations of the orbs and swords, we had [ordinary] people wondering ‘What is it?’ at the beginning and understand it the moment Fire Emblem main theme starts playing. I think both audiences were surprised. Usuda: Well, it seems half of the people already understood it from the first part though (laughs). ND: In our editing team, we had exciting talks like ‘What kind of sword is shown right now?’. Usuda: But I’m glad that there are so many fans who noticed what we had prepared. Hayashi: It’s been announced properly at E3, but this announcement had the contents of a teaser back then. That’s why I think even when we narrow it down to three titles, fans could have a clue on who will be playable characters from the swords shown in the video. ND: You did it in Hyrule Warriors too, but Koei Tecmo’s love for original works and the way of delving into them are great. How have you been making them? Hayashi: If we speak about Fire Emblem Warriors, rather than ‘us wanting to make a game like this’, we instead become ‘idiots who simply like Fire Emblem’, but in a good sense. When we’re creating games every day, we would always end up having developer viewpoints, so we are going to reset that. ND: So your consciences are using the viewpoints of fans. Usuda: Correct. That’s why at the workplace we don’t really do things systematically. Just as we have said before, it feels like we’re cramming in thoughts of staff who like Fire Emblem, such as ‘wanting this feature’ or ‘definitely wanting to include that homage’. It felt totally the same as Hyrule Warriors. Hayashi: It seems like we’re just judging the ideas thought up at the workplace. ND: So, does it feel like the favorite or interesting things about Fire Emblem from each development staff member continue to be collected? Usuda: You can make such an image. That’s why the collected ideas are condensed on Fire Emblem fan wishlists, so there are barely any points we could make judgement of. We just put them in, like ‘Yeah, that’s right’ (laughs). Usuda: Now we’re at the closing phase of development, but we’ve stuffed in too many things so I’m starting to worry on what to do. Hayashi: That means, although we may have said it that way, we’re also creating the game as fans. ND: I see. Now I understand well the reason why this is being accepted so much by users. If we’re talking about Hyrule Warriors [as an analogue], for example Marin got added there; I think you wouldn’t really make that choice unless you love the series. Hayashi: For Marin, I really like Link’s Awakening on Game Boy, so I thought it’d be awesome if we could add characters from there! Usuda: Yeah. Actually during Hyrule Warriors’ time, when we were choosing the characters we didn’t really think about their actions (movesets). We first prioritized [collecting] which characters we like, and after that we twisted the actions into them (laughs). Hayashi: That’s why this time we’re also creating it from viewpoint of the fans, and with a good sense too. Usuda: That’s right. Homages to the scenes in the original games will be well represented, so please look forward to that.